The reconfigured north entrance to the Wesley Foundation at OU will include patio seating and distinctive signage. A capital campaign will fund five major upgrades to the United Methodist building that sits at a key gateway to the OU campus: the Lindsey Street/Elm Avenue intersection. The plan includes an impressive redesign of the front entry. The Wesley’s welcome to all will be distinctive. People won’t overlook the new configuration, with patio seating and a pergola-shaded walkway. Beckoned inside, they’ll find more changes. And, literally topping off the projects, a new roof. The goal is to raise $500,000 by year’s end. For 90 years, this campus ministry in Norman has been operating. Since 1926, it has connected with 27,000 students, according to its recent Impact Report. The Wesley’s life in the past academic year included numerous student missions, retreats — and Communion served 3,000 times. Participants come from 18 countries. The existing building is 60 years old. Campus minister Daniel Dennison and David Patterson, who chairs the Board of Directors, talked about piecemeal improvements to that facility over the years. Restrooms, among the areas most recently updated, "look better than anywhere else in the building," said Rev. Dennison. Patterson said the capital campaign, "Building the Future," will undergird the Board’s comprehensive plan to make all the building "more relevant to today’s students" as well as those who will come in the future. "We literally impact the world," he said. At the Wesley Foundation, missionary Fuxia Wang and assistant Gloria Ajinomisanghan lead international student ministry that has grown to 175 people, including families. The two women are from China and Nigeria, respectively. The United Methodist campus ministry in Norman surely reflects "what the kingdom of heaven looks like," Dennison said. "We have a diverse staff that opens doors to reach different cultures. 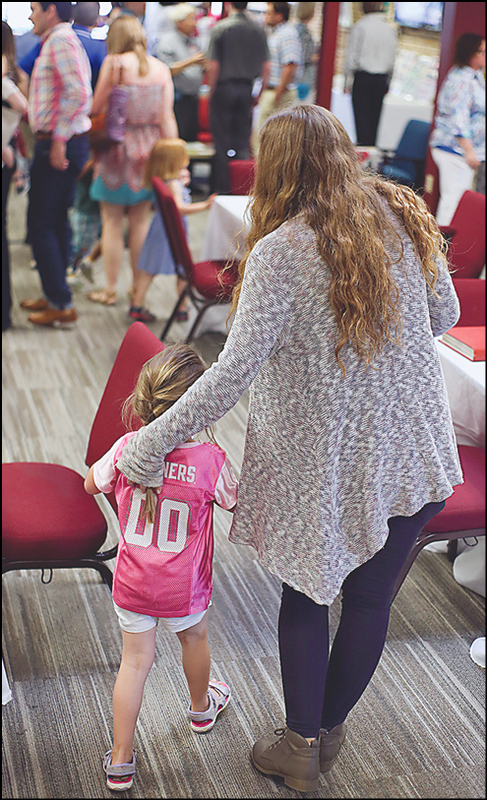 The OU Wesley is one of only a few campus ministries that offer childcare. We have probably 20 kids in the nursery on Tuesday nights, when worship is held, and there are Africans in the leadership; Thursday night worship is in Mandarin Chinese. "Testimonies in worship are pretty regular here." On many Sunday mornings, too. A praise band and several student speakers as well as Dennison travel to churches across the state. "We were in 21 churches on the Sunday after Easter." He contemplated the potential disciples among new students who arrive on college campuses at least every four years. This major building renovation is "for the 10-year-olds here in Oklahoma now and for the 10-year-olds growing up in an atheist family in China," he said. "When they come here, they will benefit from the changes we’re making." The facility changes are realistic, both men pointed out. Young adults expect excellence and functionality in a building’s design as well as its spiritual programming. "If they don’t get it here, they’ll go somewhere else," Patterson said. The capital campaign officially kicks off in September. A design preview and building tours are scheduled Sept. 2, when OU hosts its first home game of the football season; a big celebration is planned for evening worship on Sept. 5. On Aug. 7, Dennison reported $150,000 already pledged. Current and future OU students will benefit from major renovations at the campus ministry. An apartment pool in Norman makes possible a baptism by immersion performed by missionary Fuxia Wang, right, who serves at the Wesley Foundation for OU.